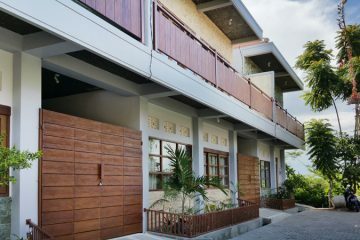 This spacious 4 bedroom villa is set on 20 are of landscaped gardens on the western side of the bypass in Sanur, just 5 minutes from from the beach and Sanurs main shopping area. The villa boasts 5 large well established mango trees in the large gardens. The single storey house was built in 2012 with quality materials as a family home, its interior western in style with some Balinese touches, with each of the main 4 bedrooms having en suites. The office can be converted for an additional bedroom with its adjacent shower room & toilet. The spacious living, kitchen, dining & outdoor area open up to the large 15 x 5 meter pool. Approximately 450m2 in size, the villa comprises of a separate section with a 3 bedroomed staff area with self-contained kitchen & separate bathroom & outdoor area. The house has been designed to maximise the light & air flow using large glass sliding windows throughout. The luscious gardens have plenty of space for kids to run around, a 2.5 meter perimeter fence & electric entry gates.